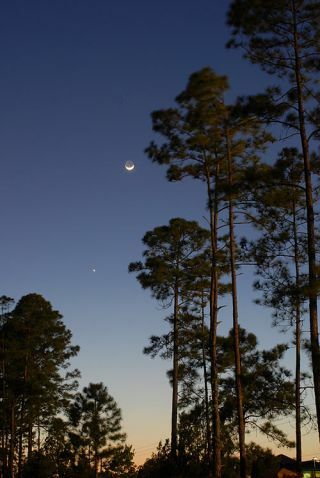 Venus and the Moon over Daytona, Florida, in April 2010. This is what the Moon-Jupiter conjunction will look like on Mother's Day, May 9, 2010. Full viewing info. If you're drawing a blank on a Mother's Day gift thisyear, why not give mom the planets? Jupiter and the moon will offer whatpromises to be a stunning dawn cosmic line-up on Sunday. A good time to look for the gas giant Jupiter and thecrescent moon will be around 5:30 a.m. local time, weather permitting,according to a NASA alert. You don't even have to drag mom outside to see theastronomical show. A glance out any east-facing window with an unobstructedview of the sky should do, NASA said. This handy sky map shows where to look Sunday morning to see Jupiter and the moon. Early-bird stargazers who do go outside with telescopesin tow should be able to see even more details of the moon's craters and Jupiter.With a small telescope, observers can discern the planet's four big moons ? Io,Europa, Ganymede and Callisto ? which are also known as the "Galileansatellites" since they were discovered by Galileo Galilee (using his ownsimple telescope) 400 years ago. Jupiter and the moon will appear in what astronomers calla conjunction, when two or more objects appear near each other and have thesame celestial longitude (on star maps) in the sky. The two objects will be separated by about 5 degrees ofarc in the sky. For comparison, a clenched fist held up at arm's length wouldcover about 10 degrees of arc in the sky. Of course, some mothers may want to sleep in on the daydedicated to them. But that doesn't mean they completely miss out. Anotherplanet and star will put in a follow-up performance at sunset, offering anotherattractive target, weather permitting. Venus is the brightest planet in the night sky, whileSirius ? also known as the "Dog Star" ? is the brightest star, accordingto NASA's alert. Observers with a small telescope can reveal Sirius sparklinglike a diamond with occasional rainbow-colored glints. Venus should appear as apearly object in the sky. If your mom gets confused over which bright object isVenus, just point to the steady, shining light. Stars twinkle in the sky (dueto atmospheric interference) but brighter, closer planets offer a steady light. For observers living in high latitudes on Earth, theremay be yet another astronomical treat on Saturday offering a prelude to thisyear's Mother's Day sky sightings. There is a 20 percent chance that a geomagnetic storm,created by solar wind particles hitting the Earth's magnetic field, may create stunningaurora displays, also known as the Northern Lights, according to theNational Oceanic and Atmospheric Administration.